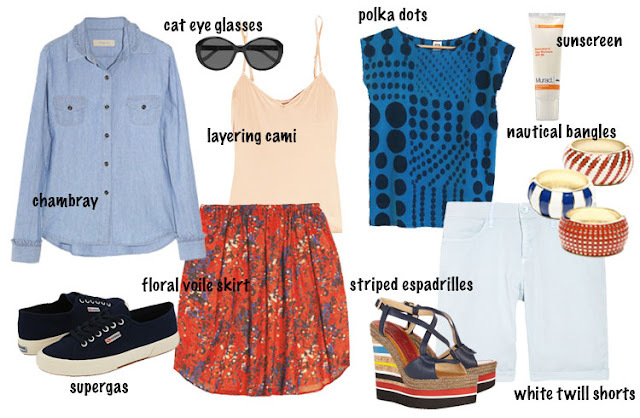 Nautical looks by way of Marseilles or the Italian Riviera have always been one of my favorites. It's so much different than say, "Cape Cod Prep" and never looks uptight or boring. I love the way European women express their individuality by totally mixing pattern and color in a seemingly discordant way yet always manage to look effortless and cool. I'm infusing my homage to red, white, and blue this Independence Day with a little European flair. This is exactly how you should incorporate the new chambray shirt you bought last weekend. As a final note: the layering camisole (AKA: your new bra ) should be worn under everything to keep you feeling comfortable and protected.